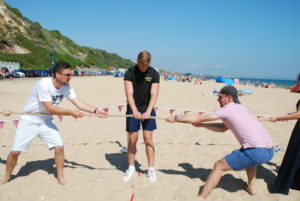 On 14th July, South Coast Events provided a team building day for Morgans Property Consultancy. The company have offices in Bournemouth ad London, as well as some contractors who are not based in-house, so the company wanted to bring everyone together. The weather was certainly on our side, with the day being in the middle of the heatwave that July saw, although that did mean we had to be extra careful with not over-exerting anyone and making sure everyone was well hydrated. The group arrived at our spot on the beach, which we’d set-up earlier in the day with poles and bunting marking the area we were using. The group were divided in to four teams to take part in some team building games. The first activity was a sack race relay. Sadly we don’t have any photos of this…it wasn’t because we were too busy laughing, honest! 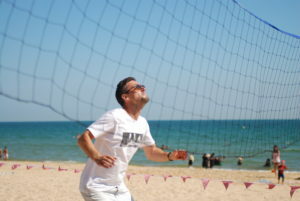 The next activity was beach volleyball and this definitely brought out some people’s competitive spirit! It’s a great game to encourage working together and also for the stronger team players to help the more inexperienced team members. Next up was Tug of War. Again, you could see which people were truly ‘In it to win it’! 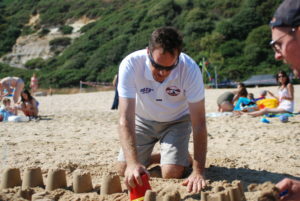 The activities finished off with a sandcastle building contest. This may sound like a childish game, however, I’ve never seen people so into an activity! 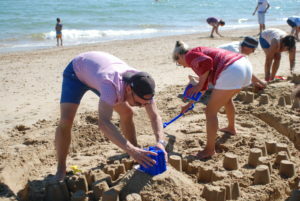 Listening to people, most haven’t built a sandcastle since they were a child and there’s nothing quite like taking part in something that makes you have a proper belly laugh! 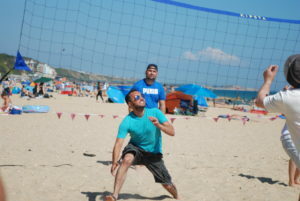 Of course, the winning team were awarded sticks of Bournemouth rock – what else could we have given for a beach day? 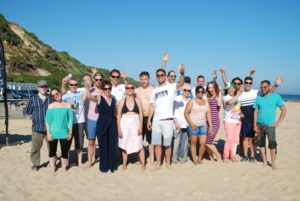 After working up an appetite, the group enjoyed a very delicious Beach BBQ, prepared by Molecular Magic, a Bournemouth event caterer. 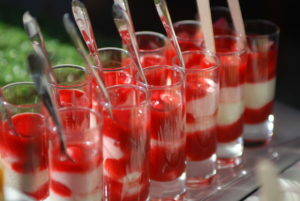 If you’re looking for someone to organise a team building event or another event, for your company, to get in touch. 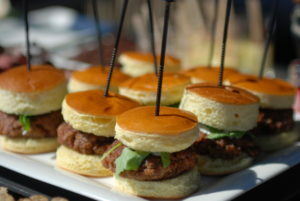 We can plan, manage and theme all kinds of events; award ceremonies, parties, team building and festivals.